So today we’re going to get serious because we work out all our feelings by relating them to books! This is an apology to a fictional character– more specifically, Primrose Everdeen. At the Mockingjay Part 2 panel at Comic-Con, Conan O’Brien joked with Willow Shields, saying “I was so mad at you when you went back for the cat!” And mostly, our reaction was “Well.. duh.” It was a rash, irresponsible move made by a young girl who’s almost too sensitive for this world. Buttercup was an adult cat and hell, cats don’t even live that long. Why would anyone risk anything for a cat?! Katniss, while we loves her sister, thinks she’s an overly sentimental piece of work when it comes to this issue and audiences kinda do too. Well, I’m sorry, Prim. It’s unfair to judge you because I really do understand. This picture is roughly 17 years, 8 months old. I’m 10-years-old– hence the bad hair, fashion, etc. 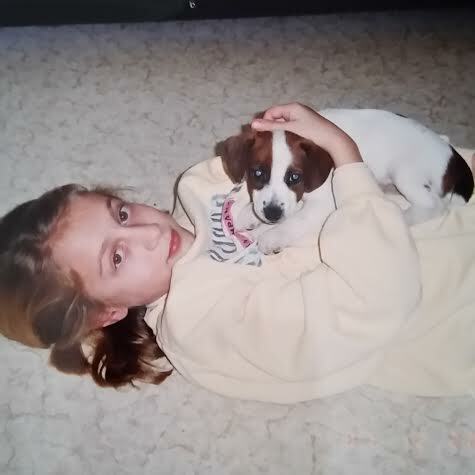 The puppy here is Jake, my family’s Jack Russell Terrier who died of old age this past Sunday, four days before my 28th birthday. He was the best dog ever… though perhaps I’m biased. And truthfully, I totally would’ve gone back from him in an emergency situation. It’s not that uncommon. In scary situations, people rescue their pets. They sometimes get injured or even die themselves in the attempt. To some, that just sounds crazy, but not to me. I don’t consider myself all too sentimental, but pets become an important part of your life in a way that most humans don’t even. They’re a furry ball of friendship, playfulness, and companionship without an ounce of judgment. And dammit, we all need some of that! So risking it all for our animal friends makes sense. It’s silly to think of the continuum of the story after the final chapter (but before the epilogue) because everything is just head canon from that point on, but we can’t even imagine how Katniss felt when Buttercup finally went. We see the two forming a bond over the loss of Prim at the end of Mockingjay, and I’d like to believe that they stuck together and learned to love each other. That means that things would be rough for Katniss not just because she lost a pet, but because that pet was one of the few things she had that linked back to her sister. And urgh… we can’t even. Though the most minor of minor characters in The Hunger Games, Buttercup makes a major impact on the plot and the characters’ emotional wellbeing, which says something big. So we get it, Prim. And really, you’re awesome for doing it. ← Is Trailer Peeta the REAL Peeta? I really do NOT understand why anyone would not go back for the pet. If I had to decide who to save: my kid or my pet, well, no question there, but how can a feeling caring being consider it not worthwhile to go and save another feeling caring being – that´s beyond me. Period. I think it’s also telling that D13 does not allow pets in the first place, and Prim even having access to Buttercup was a concession Katniss had to wrangle from Coin. And of course from Coin’s POV it makes sense. Pets are a luxury, a needless waste of food and whatever time is “wasted” caring for them. One can even argue that D13 only survived because of their cold, utilitarian approach to life. I think that it’s also telling that while D13 doesn’t even bother with marriage ceremonies, couples just fill out a certificate and are assigned a compartment, the impoverished residents of D12 DID cherish such ceremonies, even if the bride’s wedding dress was usually a threadbare one-day rental. There seems to be a point being made here that some “luxuries” such as pets and wedding gowns, even fashion or “meaningless” rituals (I can see Coin being honestly perplexed when hearing of District wedding traditions), are actually an important part of being HUMAN. Many think the point of the Hunger Games is that “people will do anything to survive, and really are not much different than animals” (Gale might actually believe this himself, at least before he grows up a bit), but I certainly don’t think that was SC’s intent. Also, for Prim to care about a pet so much in the world of Panel speaks volumes. In this world of trying to survive, many would put themselves first. But Prim, and Katniss, are unique because they don’t, they realize there are other things worth caring about. That is part of why Katniss loves her sister so much, and what she is fighting to for – a world where caring for others is not so unusual. First thing I want to say is cats typically live longer than dogs. I know this is not the point of the post just defending the bad rap cats often get. What 13 or 14 year old hasn’t valued their pet more than anything at one time or another. Katniss brought her Buttercup to begin with, and don’t you think it was Buttercup she held when she worried about Katniss in the games. I questioned her going back for Buttercup less than I wondered about Gale going to retrieve Katniss mementos. I guess it shows how love messes with rational thought. I agree that when Buttercup dies it will be hard for Katniss., maybe it helps open her heart to having children. I figure Buttercup sticks around for another 5 years at least, especially with his new lifestyle.